What are the best things to do in Montreal with kids? Find out the highlights from our visit to Montreal and what you cannot miss on a Montreal city break with kids. We decided to go to Montreal following Philip’s memories from when he was a student. His students-years tales about the city didn’t immediately scream ‘family destination’ to me, but I always wanted to go to Quebec so when we got an offer for a home exchange there, I was happy to give it a chance and try a Montreal city break with children. It turns out that Montreal is a fantastic city to visit with children. It has a relaxed, friendly vibe, it is full of young families and it’s possible to enjoy its coffee culture and interesting heritage in the company of little people. This is our list of the top things to do in Montreal with kids, with Montreal family attractions and fun places you and your children are sure to enjoy. Keeping the list this short was a challenge, we loved so much about the city, but these are the ten things out kids loved the most about it and what made our Montreal vacation with kids one to remember. 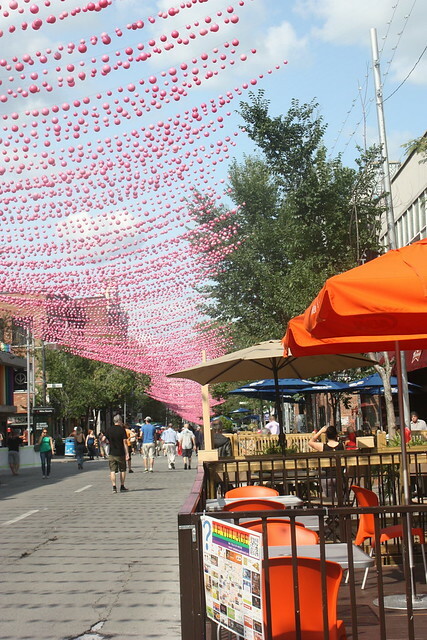 A city break in Montreal can only start with a stroll in Old Montreal. The cobbled streets of the Old Town, the historical centre of Montreal in the photo above, deserve the top spot in our list of the best places to see in Montreal with kids because of their beauty and family-friendly vibe. This part of town dates to the XIX century and it is widely responsible for Montreal’s reputation as the most ‘European’ of Canadian cities. Here older, historical buildings stand against the backdrop of high skyscrapers and big avenues make way to small roads dotted with elegant boutiques and shops. This area is famous for its many beautiful buildings such as the Hotel de Ville and the Basilique Notre-Dame, among others, and these attractions will tease you and stretch your sense of space: the distinctive French style of this part of Montreal mixes with a distinctive Canadian vibe that will make you second guess your exact location! We visited this part of town on our first day and it was the perfect family activity to get a first feel for the city. This area is served by Montreal’s good metro system and can be easily discovered on foot. We spent here a full morning, pottering around the shops and seeing the famous Place des Armes, but we found ourselves back here many times. What kept bringing us back were the many restaurants and family attractions such as Montreal science museum (see below) and of course Montreal’s famous old Port. Montreal’s botanical gardens is a big green space, just at the back of the Olympic stadium. It’s a place worth spending time in: it’s beautiful, interesting and it’s safe for children, who can run around without cars or majour safety concerns. Some of the most beautiful gardens were the Japanese and the Chinese ones, where it is also possible to stop for a cup of tea. 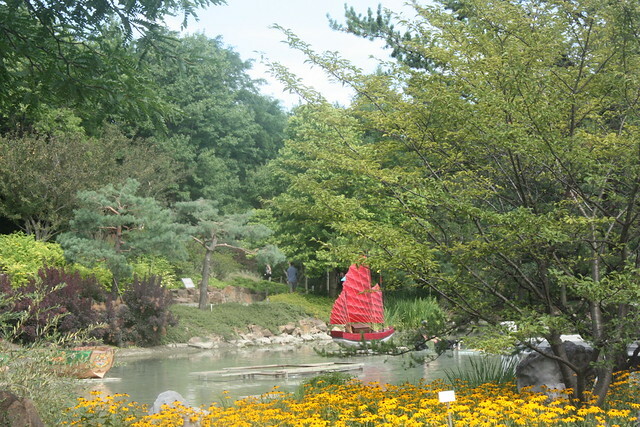 The botanical Gardens of Montreal are a beautiful, interesting and safe space for families and this is why we recommend it as one of the unmissable things to do in Montreal with kids with kids of all ages. Within the same complex as the botanical gardens, the insectarium is exactly what you think it is: a big museum of insects. Some of them are dead, pinned into glass cases, but some are not: you can see ants, stick insects and a huge variety of animals in replicas of their native environment and at different times of the day, under supervision, you can even get them to crawl on your hands! I am not the best person to be around insects (this being the understatement of the year, you can read my post about my butterfly phobia to understand the extent of it) and went into the insectarium partially to escape the rain that suddenly caught us and partially to prove that my phobia does not need to pass onto my children. Of course, the kids loved the place, while I spent half an hour flaunting an easiness I did not have and making sure I wasn’t too close to any of the glass cases… It was my personal room 101: what do we do for our kids! The biodome was a lot more my kind of place. It is a wide dome inside which a few different climates and eco-systems are replicated: you go from a large room devoted to the rain forest, with birds and small monkeys, to a Canadian northern ecosystem, chillier and home of racoons and furry mammals. What changes around you is the temperature, the humidity and, of course, the animals: you will find yourself putting on warmer clothes as you walk on! It’s a real tour of the word in about 30 minutes: really enjoyable and interesting and one of the most fun things to do in Montreal for kids and without if you love animals. On a rainy day, we brought the kids to the science museum. It is a wonderful space, at the old port (itself worth visiting) and one that is largely designed for a young audience. The kids loved the mechanical machines and us adults loved an exhibition they had about family food across the world – eye opening! One of the things that made Montreal ideal for a family vacation is its many parks. The biggest inner city park is Parc du Mont-Royal, in the North Western part of the city, and it’s a beautiful green space with a plethora of things to see and do for families with kids (but also without!). Like the name suggests, the park develops over a mountain and it is possible to reach its summit on foot or more easily, with little legs in tow, by bus (the climb is on a large paved road, but it is steep and to be avoided with a buggy). However you decide to tackle the ascent, at the top you will be rewarded with beautiful views over the city, a pond with ducks, cafes and some interesting constructions such as the Croix du mont Royal, on of Montreal’s landmarks, and the historical Chalet du Mont-Royal. The day we got the bus to Montreal summing was one of your favourite of our summer in Montreal. I loved the view over the city and the kids enjoyed running around the Lac des Castors nearby: we all then moved to the Maison Smith cafe for some of Montreal’s famous coffee and delicious cake. Top tips for families on a Montreal city break with kids: as well as big parks such as Parc du Mont Royal, Parc La Fontaine and Parc Jean Drapeau, Montreal has many green squares and smaller parks where kids can take a break from sightseeing and play even in the centre of town. These squares are marked on all city centre maps and while gated, in a style somehow reminiscent of some London squares, are open to the public and often sport good playground equipment. By far our favorite family activity in Montreal was cycling in Parc Jean Drapeau. The park is an island in the mighty San Laurence river and is full things to do for kids: in the summer you can pretty much spend every day there without getting bored. The island has many attractions including the world tallest wooden roller coaster ‘La Ronde’ and an interesting museum hosted in the Biosphere, with exhibitions about the environment and its current challenges. If you are feeling active and are looking for a fun activity to experience in Montreal with kids, consider hireing bikes in Parc Jean-Drapeau and explore the island. 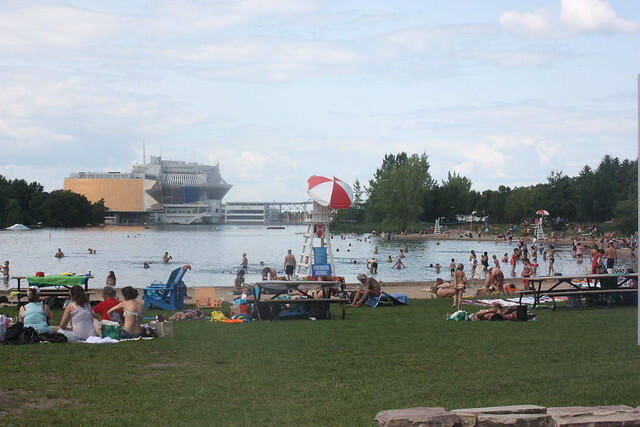 You can’t beat water when it comes to entertaining children and Montreal’s beach and water complex did not let us down. Both are hosted on the islands: the beach is small but sandy and safe, with a playground and a cafe with burgers, sodas and beer; the water complex is a functional, spacious pool or rather set of pools with space for diving, swimming and even a splashing pool for children. Montreal is a famous foodies destinations: eating in its many restaurants and exploring its fabulous markets is one of the top things to do in the city and the variety and quality of food will never let you down. Montreal’s markets managed to turn food shopping into a fun family activity. 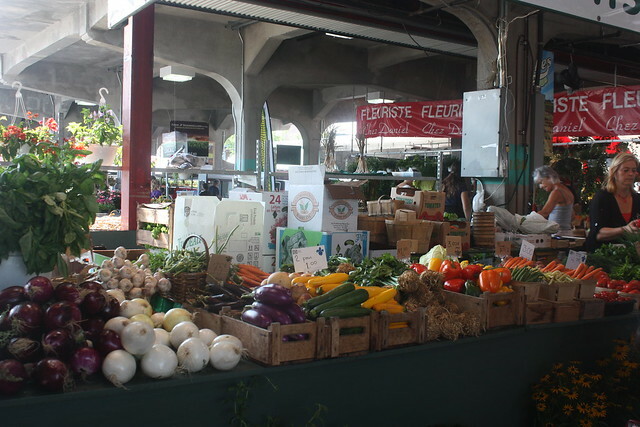 During our Montreal city break with kids, we visited March Atwater, Marche Jean Talon and Marche de Maisonneuve, just beside our house. The markets were a particular hit with our kids and going food shopping became one of your favourite Montreal family activity. Contradicting the rule that says you should never go food shopping when hungry, we always went at lunchtime as many of the stalls sell noodles and crepes. As well as markets, we tried many restaurants and we were always pleasantly surprised how child-friendly everywhere seemed to be. Rue St Denis, right in the centre of town, was one of our favourite hangouts (I believe we ate in every single establishment there! ), but our favourite places of all were Beauty’s Lancheonette, on Mont Royale, Mai Xiang Yuan, Chinatown (dumplings) and of course the iconic bagel shops in Mile End and Outremonts, one of Montreal’s institutions. We had our Montreal city break in the summer but we were not lucky with the weather. It rained solidly for over one week and, with kids, this can be a problem. 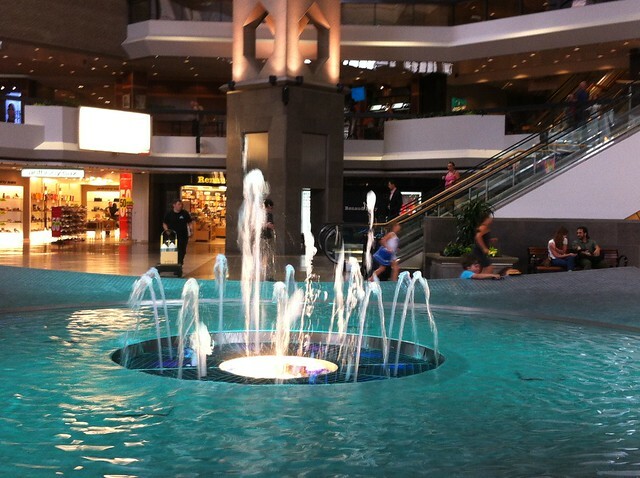 Thankfully, the city is well equipped for indoors entertainment and the underground city, with its impressive fountains, was a god refuge from the rain. One of the most fun places for kids in Montreal is a space that is not designed for them but for anyone seeking refuge from the cold: the underground city! Last but not least, one of our favourite places in Montreal was the stadium. We did not visit during the day, but brought the kids to an open air free concert of Carmina Burana there: a great mild summer evening out and definitely a location worth checking out! I hope you enjoyed our list of ideas to enjoy Montreal with family! Do you know Montreal? Do you have favourite things to do in Montreal with kids I don’t know about? Attractions and businesses in this post are mentioned for information purposes only. We have no affiliations with any of them and received no compensation for their inclusion.